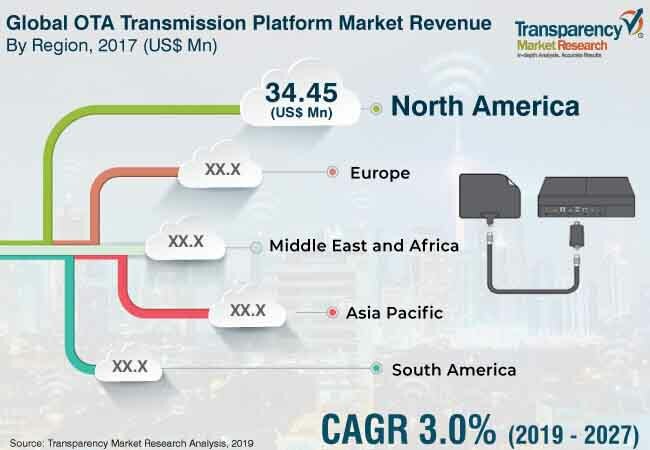 According to a new market report published by Transparency Market Research , the global OTA transmission platform market is projected to reach US$ 132.7 Mn by 2027. The market is expected to expand at a CAGR of 3.0% during the forecast period from 2019 to 2027. Furthermore, the platform segment accounted for highest market share in the year 2018 due to adoption of televisions, TV tuners, and set-top-boxes. North America and Asia Pacific are anticipated to lead the global OTA transmission platform market during the forecast period, followed by Europe, Middle East & Africa, and South America. The Over-the-air (OTA) TV market is projected to grow in the coming years. This transmission platform offers free TV through a digital antenna. More channels are available for free and in better HD quality due to the shift to digital broadcasting. A significant number of houses are receiving their television via over- the- air antenna. One of the main deciding factors of television broadcast choice by the audience is the quality of live broadcast. Currently, younger audiences are re-experiencing the high quality of free live broadcast on Over-the-air (OTA). OTA transmission platforms play a significant part in the Canadian broadcasting system. Additionally, an Over-the-air transmission platform delivers an extensively available and reasonable choice for Canadians wishing to access local and other television programming. The impact of this driver is high as the broadcasting industry is also changing its broadcasting channel platform by adopting OTA transmission platforms. The global OTA transmission platform market has been segmented based on solution and geography. Based on solution, the market is segmented into platform and services and services is further segmented as consulting, installation, and support/maintenance. North America and Asia Pacific held considerable market share in the year 2018. Over-the-air transmission platform market is driven by the South Korean government and its major television manufacturers such as Samsung and LG Electronics. The market in Europe, Middle East & Africa, and South America is expected to expand at a rapid pace during the forecast period.